Cut eggplant into thin strips. Thinly slice green onion and set aside. Bring a pot of water to a boil. Put the colander or sieve over or in the pot and make sure it does not touch the water. Place the eggplant into the colander or sieve, cover, and steam for approx. 15 min. Meanwhile, wash rice with cold water and cook according to package instructions for approx. 15 min. Remove any excess water and set aside. Peel ginger and garlic. Crush with a knife and chop finely. 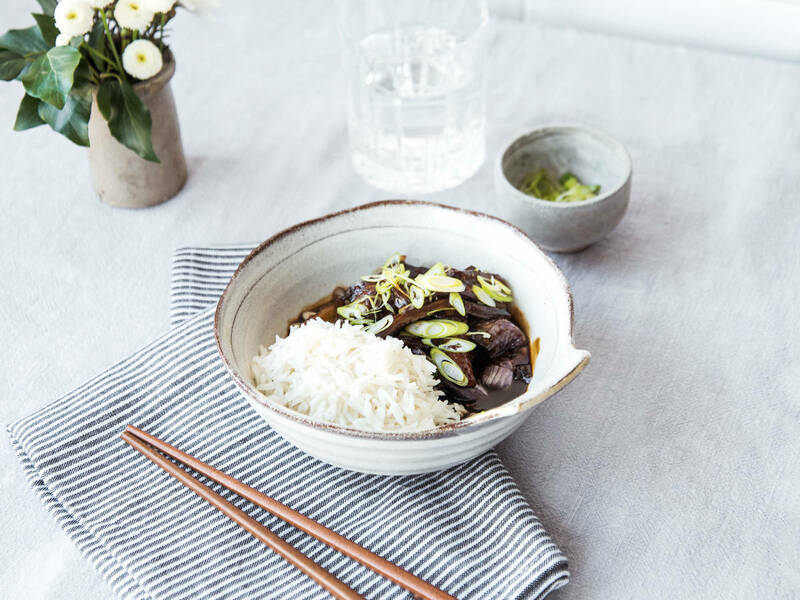 In a pot, mix together with fermented bean paste, Sriracha, light and dark soy sauces, sugar, rice wine, sesame oil, and black rice vinegar. Stir until fully combined. When the eggplant is cooked, bring the sauce to a simmer. Mix potato starch and water in a bowl. Pour the starch slowly into the sauce and stir to thicken. Transfer the steamed eggplant to the pot and toss to cover with sauce. Sprinkle green onion over and serve with rice. Enjoy!